It seems the tug of war has been started between the 5200 put writers and 5400 call writers which keeps the market in a very compressed and in sideways mode. 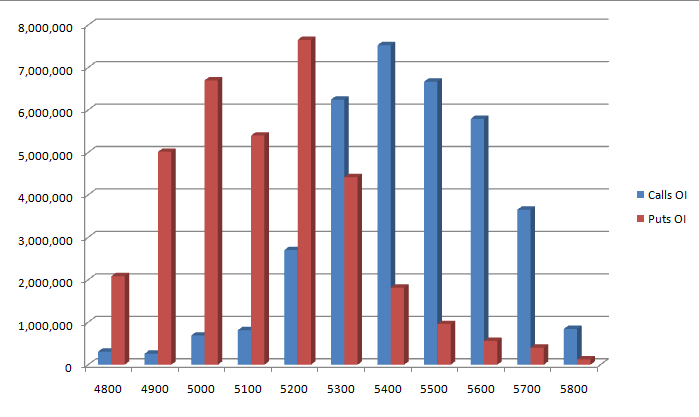 Almost equal amount of open interest is build in both 5200 put writers and 5400 call writers which indicates both are confident on their own opinions that call writers are confident on 5200 will act as support for this expiry and put writers are confident on 5400 could act as a resistance zone for this expiry at this instance. Please post updated Oct call put Open interest analysis? Thanks about nifty future live charts. I cant get time left in second. I all small trader will be ntimes thankful if u start minifty live charts.